Injured, I have not been out and about on a hike in six weeks. My body has been unused and weakened from inactivity. I am determined to get started on my recovery. 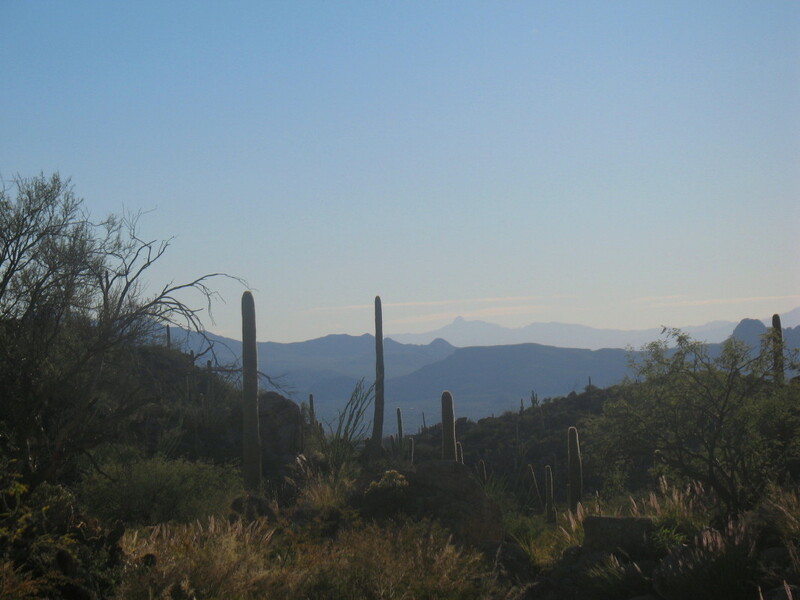 The day is perfect for a trek up into the Tortolita Mountains. There’s not a cloud in the sky. The temperature will top out at 75F. There is no wind to chill, just warm sunshine. We have been told that the gate that has blocked out access into the Tortolitas has been damaged and remains open. With the option of driving further, we haven’t decided where to go. Maybe to visit the petroglyphs, but I don’t want to overdo it. I’ll go as far as I can get comfortably. My body will tell me. We are dismayed. The gate has been repaired. I back down and park the truck nearby. There will be no four wheeling today. We will have to climb the hill before getting into the best of the mountains. I’ll probably not get as deep into them, but it is the journey, not the goal. 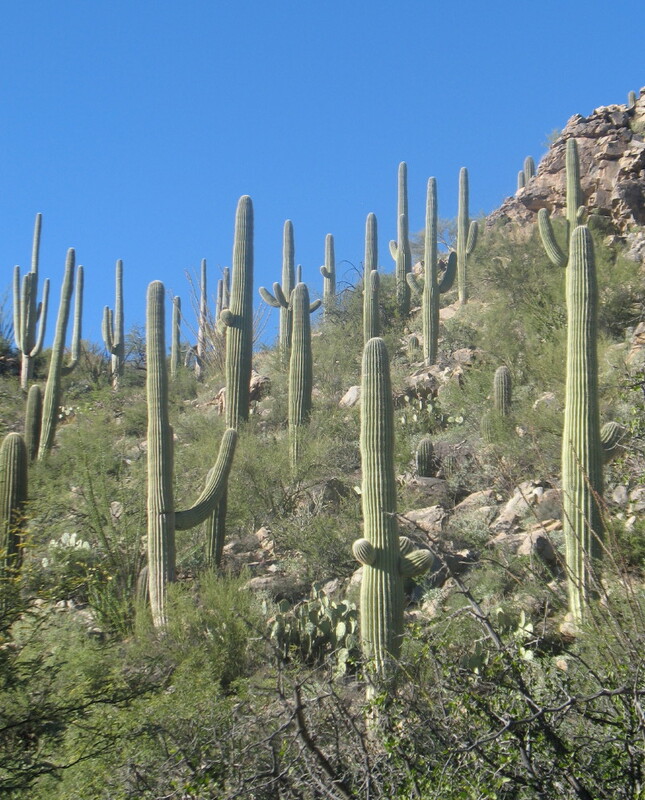 The desert is lush and green after the weekly rains. There will be much to see. The wash crosses the trail. There we turn right to go upstream. We have seen no tracks, only a few from a mountain bike or two. 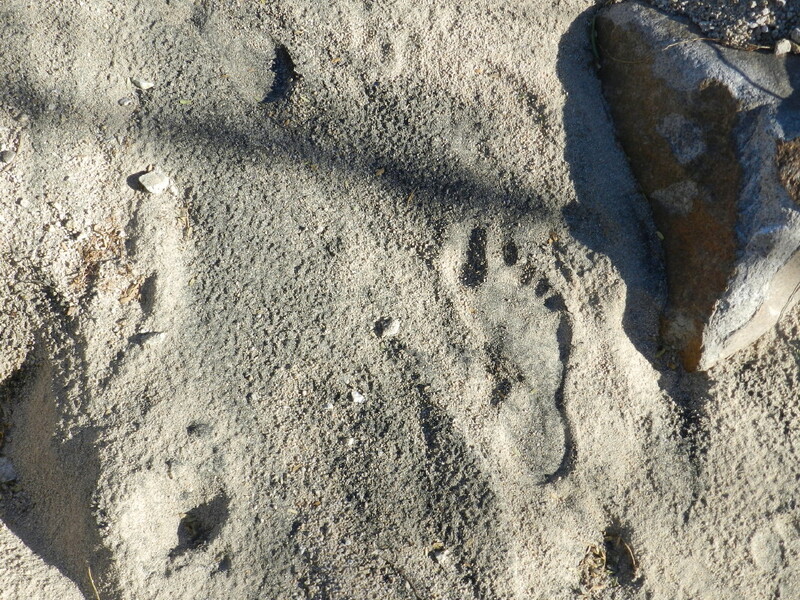 Here in the streambed, there is only one other set of human prints in the sand. These show that they have returned. It hasn’t rained for several days and these are the only tracks. These mountains are ours. There will be no need for cover, so we continue on, still without clothing. I carry a delivery boy sling style bag with water, snacks and emergency necessities. I continue to use my rolled up sarong to cushion my shoulder from the straps. DF has already handed me the white blouse that she had for sun, warmth and cover in case we encounter others. I have had it slung into the bag and strap, so all that she has needed to carry is her camera. The rains have created a whole new place. I don’t recognize much of the formerly familiar wash. The sands have been washed away and there are many rocks to use as stepping stones instead. The growth has covered the area with bushes and tall grasses. Everything is green with leaf. 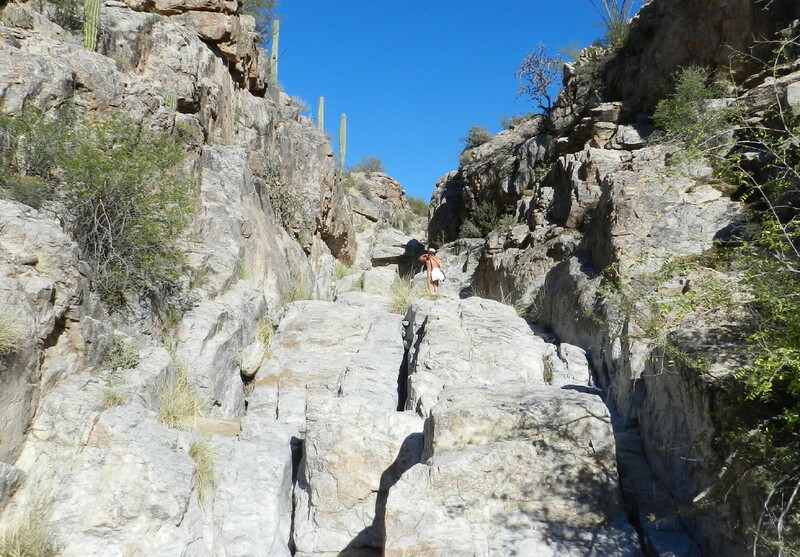 We eventually find familiar areas of bare granite rock, which are worn smooth from centuries of water and wind erosion. 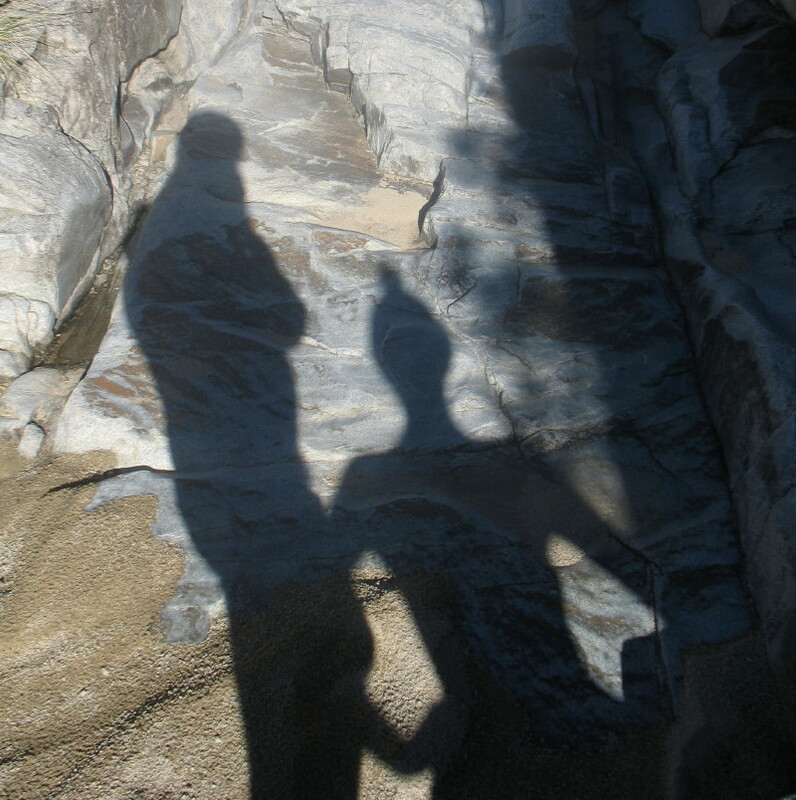 We climb through rock formations, on steps made from the same. This is always fun. Each footing must be checked. These can be slippery. The sand from a shoe can create an effect like sliding on little marbles the size of grains. 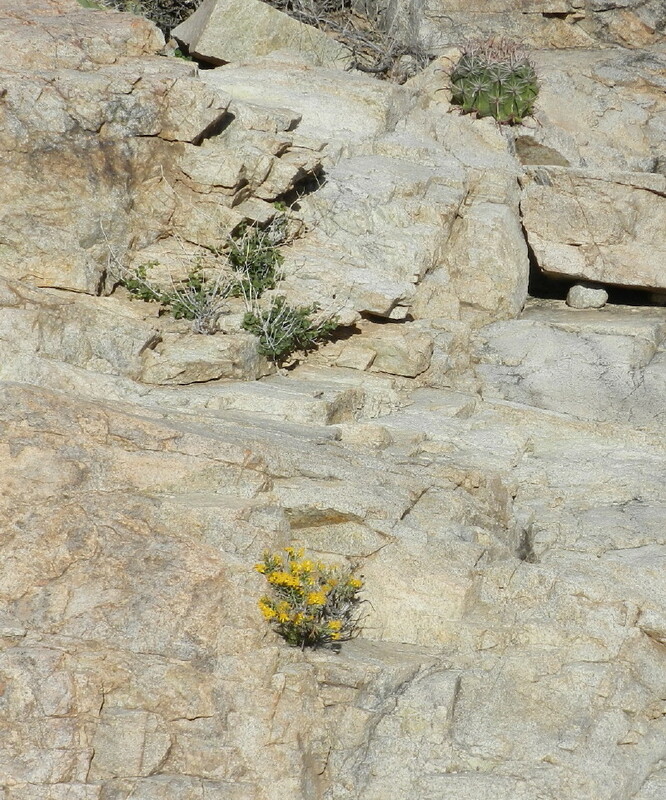 Plants grow out of stone. We come across a pond. The water has been splashed, obviously just before we arrived. 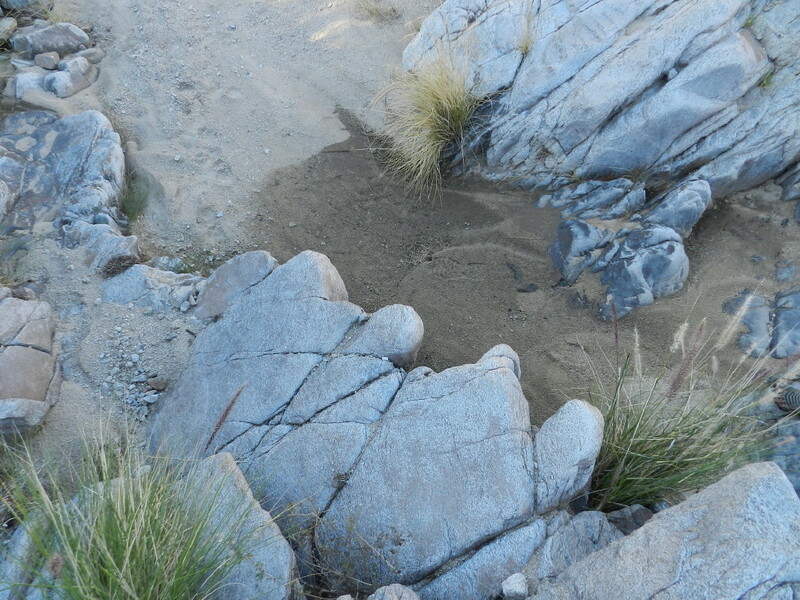 There are javelina tracks all around. They had to have heard us coming, gotten excited, and darted away. Finally we arrive at the climb where water falls when it rains. Above this, we will take a short break, enjoy the cool rocks and warm sun, have a snack and move on. Getting there requires a climb over ponded water. 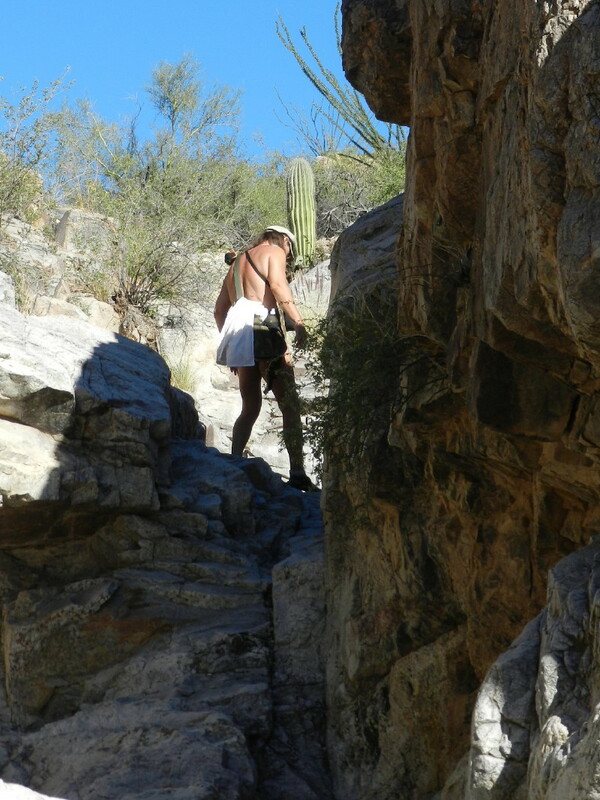 It is very slippery here, but there are many footholds and hand holds. It isn’t scary, just fun. We lay around on the bed of granite. DF tries a series of experimental shots as she lounges. It is a peaceful familiar place. She remembers one of our first dates when I brought her up here under the bright light of the full moon and we laid on these same granite slabs, watching the sky. Resuming our walk in a perfect day, we continue to find the growth has made the place look unfamiliar. It is good that it feels more like a first time, a new place. It has been cold the last few nights, down into the 30F’s. We would expect snake season to be over. 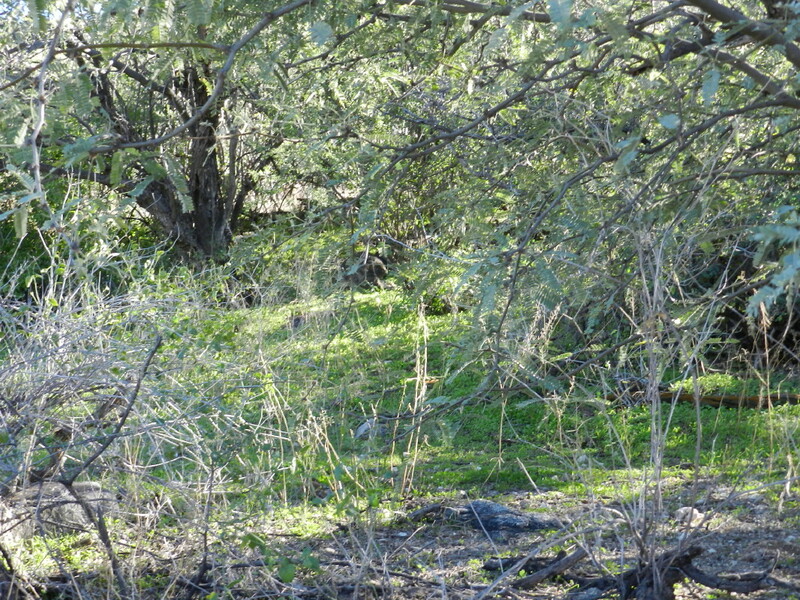 We are walking with more confidence amongst the tall grasses, where a rattler may hide. 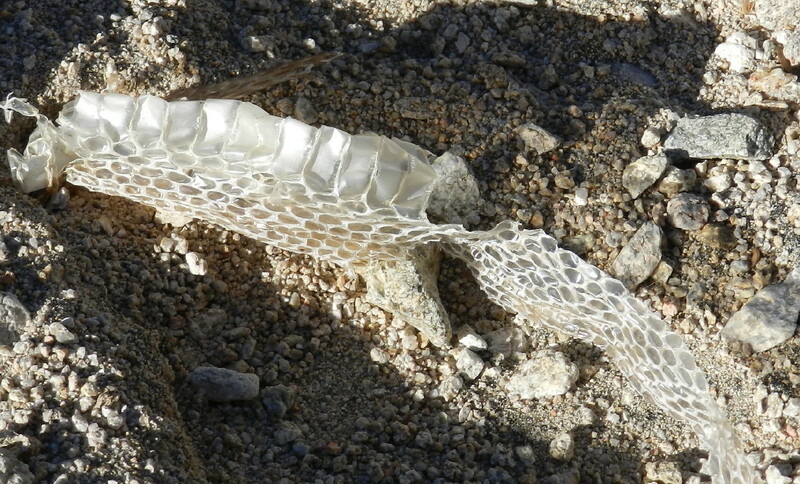 We come to a sandy spot where one had shed its skin. We wonder if this was something blown here, or the shedding has been since the recent rains. It is in the sand. Fascinated, DF gets down for a close up shot. 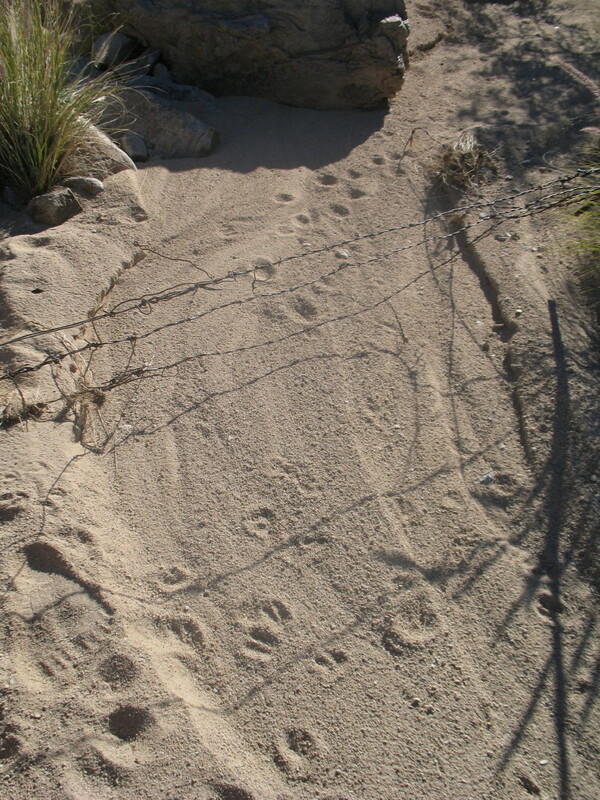 There is a barbed wire barrier to keep cattle out of the area, which crosses the wash. We find the tracks of deer stopping here and turning around. They have lost access to an abundant area which leads down into the foothills and an important watering hole. The ranchers who lease the area destroy the abundance on these deer’s side of the fence and make just a few dollars on state owned land. This day, we see less destruction. The plant life has been growing and the wash gives us fresh sand, smoothed and channeled by the rains. 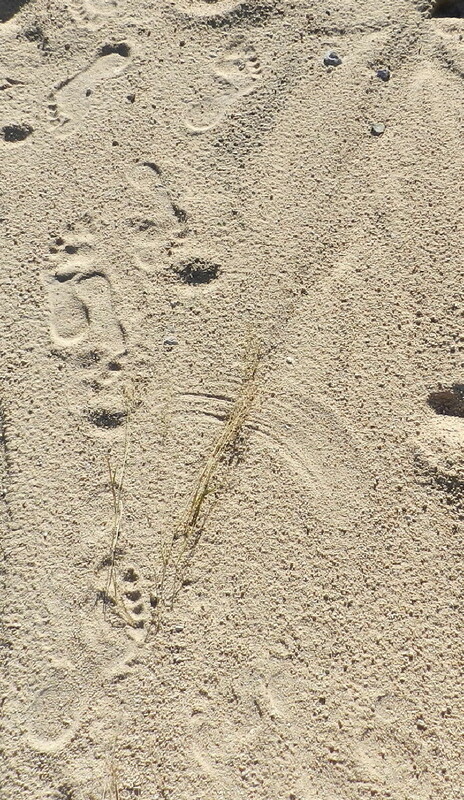 There are only the distinct tracks of wildlife today. The wash is cleansed. 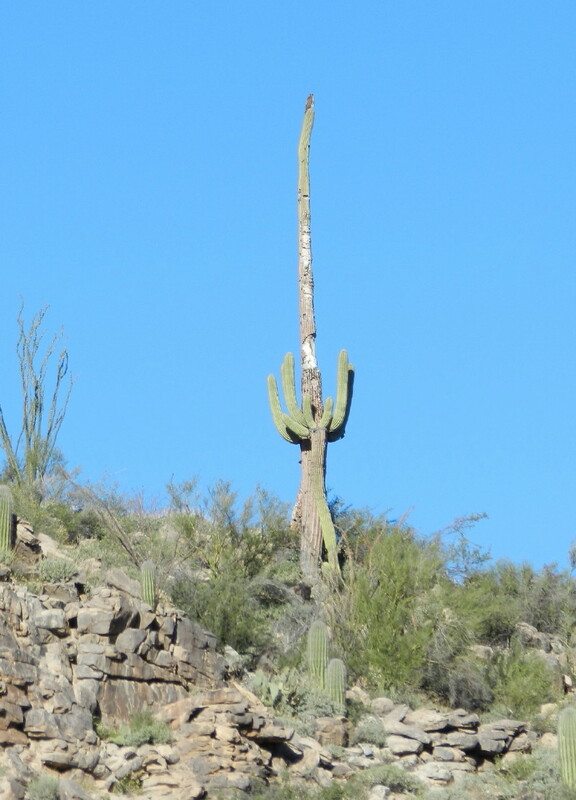 Up on a ridge there is a hulking saguaro that has seen many traumas in a long life. At the top, we can’t tell if there is damage, or an animal. I ask DF to zoom in. Later, we can zoom further on with the computer screen. 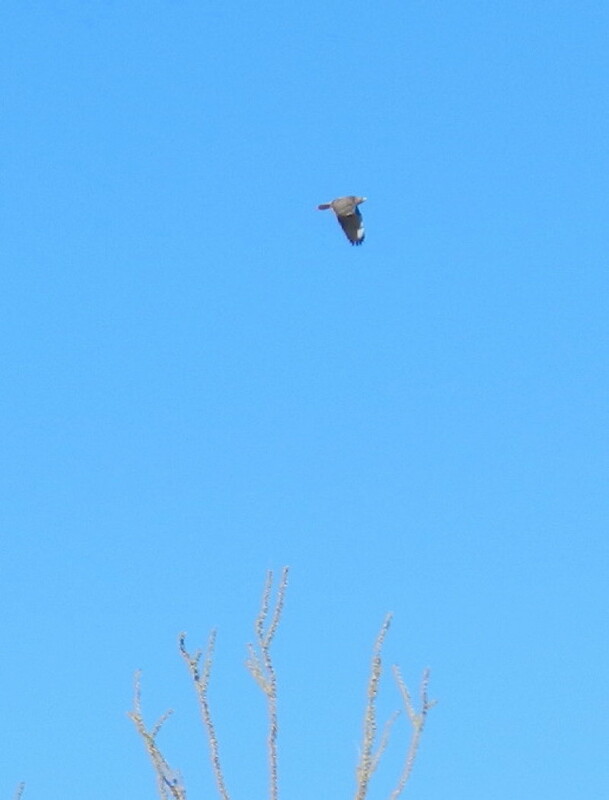 As she focuses, we see a large white tailed hawk take flight. This big fella may be the reason that there are so few bunny tracks showing in the sand. 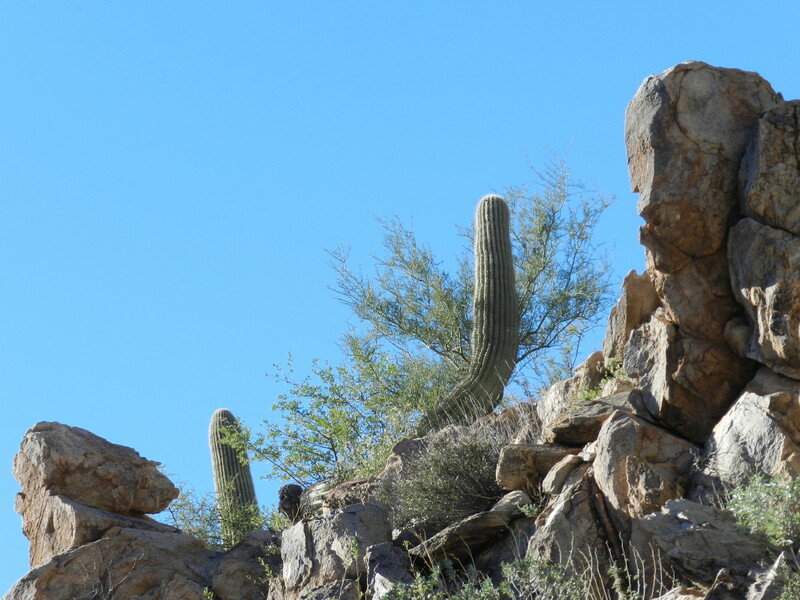 That old saguaro is an excellent vantage point. Along the wash to the south on a north facing slope, the vegetation is emerald green. There are fields of moss, and young winter sprouts that will become flowering color next spring. This doesn’t have the look of what one would recognize as desert. There is new growth, a fresh arm on an old friend that we recognize. Many rise. Who will survive into an old age? We find a stretch where the wash widens out and becomes level. It is like a sandy highway after stepping from rock to rock. My fatigue has set in and we decide to stop and rest. The stretch of sand is inviting. We lay out our useless clothing on the sand and sit down, finding some justification for carrying it. We disrobe completely. The pristine sand is too inviting, not to be barefoot all over. We snack, on almonds, cashews, dried apples and Mandarin oranges, and then begin to just sit quietly. All day the silence has been profound. There have been only occasional sounds of birds. Over and over, our feet created a crunch each time that we stepped onto the sand. We sit in this silence. 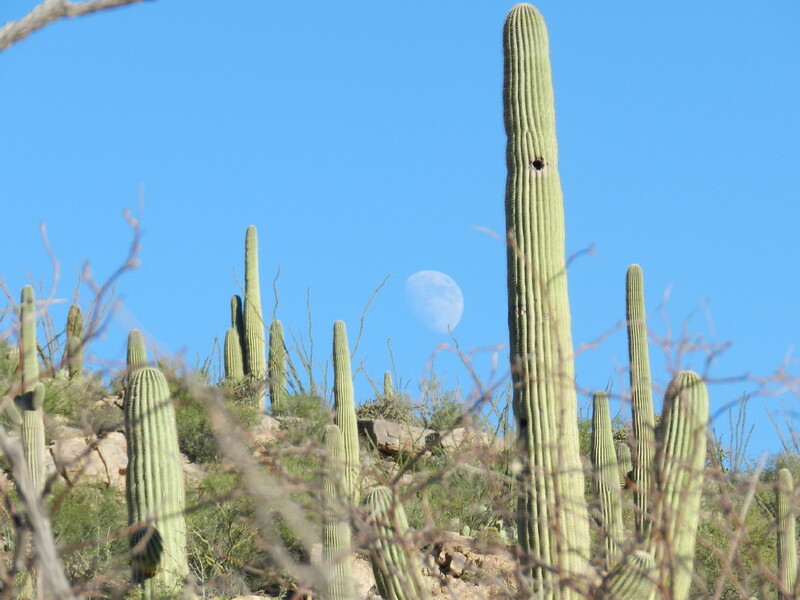 We smell the familiarity of the desert, as its scents flow down the hills and gently through the wash. There is silence, inside and out, a gripping sense of being engulfed by its emptiness. It teaches how to be quiet. All around there is grace. 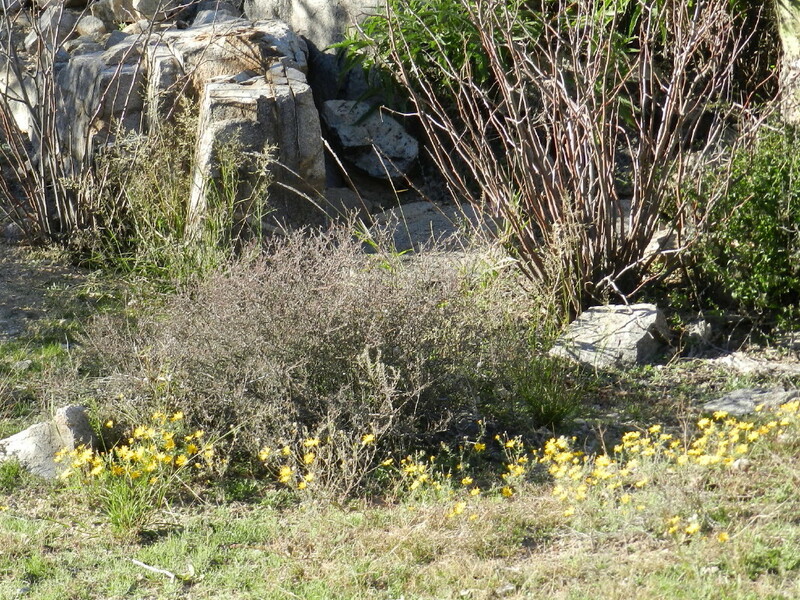 There are patches of flowers, as if it is Spring already. We decide to give the Gorilla Tripod a try. We haven’t ever taken pictures together. I set the timer and as the beep continues, I scurry over to DF, who is at ready. We begin to stroll arm in arm. As we pause, the beauty of this place sinks into our being. We shoot another. The smooth but firm sand is a sensual treat for the bottoms of our feet. This time, we continue strolling down the path as far as we please, photo session over. A whip of a plant has left its mark in the breeze. We are reluctant to return, but we are grateful to know that the other half of or tour awaits us. The moon sneaks up on us. 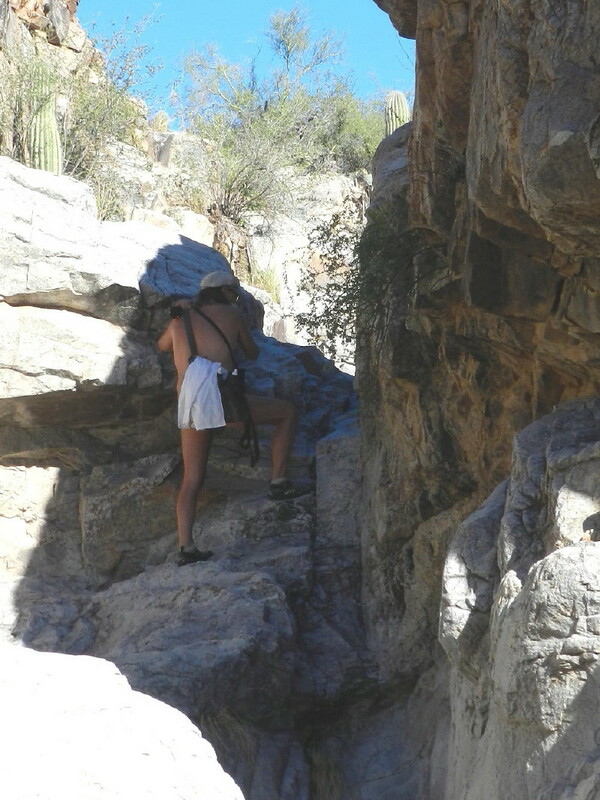 It always seems more precarious climbing down. We follow the canyon toward home.